The Riviera del Brenta favoured by Casanova, Galileo, Byron and D’Annunzio, painted by Tiepolo and Canaletto, described by Goethe and Goldoni, hosted French and Russian Royal Families. Even Napoleon, the Hapsburgs, the Savoys stayed here. "Once, this was a magnificient and glorious river depicted in the abbots’ rhymes when the Burchielli full of nobles and music navigated it" wrote Gabriele D’Annunzio. On the 17th April 1345 the Major Council of the Venitian Republic abrogates a law denying the Serenissima citizens the possession of land. 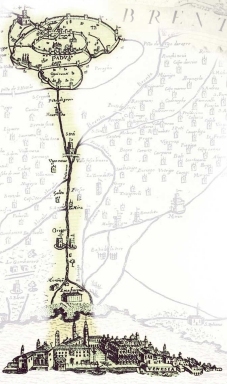 So, most Venetian noblemen turned their interests towards the land and in particular on the Brenta Riviera side. Therefore, along with the increasing farm produce due to the exploitation of the land, they built residential farms, gathering in one complex the owner's house and buildings planned for other usages. The "villa-factory" for those who wanted to work the land, the "villa-temple" for those who wanted to gather artists and intellectuals, the "villa-palace" to represent the power of the family and host their parties and banquets. Great architects, such as Palladio, Scamozzi, Frigimelica and Preti, designed summer residences for the Venetian nobles and patricians who would spend some time in the Villas of the mainland. Thus, the Brenta Riviera changed into a long and continuous succession of Villas, palaces, and gardens until the Riviera was considered the continuation of the Venetian Grand Canal. 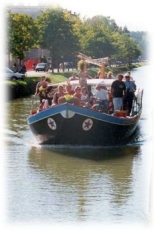 Here, not far from Venice, rich patricians spent their holidays: they left on comfortable barges, burchielli, that could navigate the shallow river. The boats were pushed by oars from St. Mark's through the Venetian lagoon to Fusina and then pulled by horses along the Brenta. Here began the "mania of the villeggiatura" (to spend the time in the Villas of the mainland and to live in complete freedom); Goldoni writes that everything was allowed and possible: to play, to eat, to trow parties night and day. 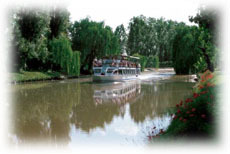 The boat trip of the Burchiello was fascinating, going slowly by villas and weeping willows while comedians and musitians entertained young ladies, galant men, nobles and adventurers. It was customary "to go from a Villa to another" so, the happy groups spent their time enjoing parties in different Villas. The mini-cruises run all days but on Mondays, March to October, and start in Venice (on Tuesdays, Thursdays and Saturdays) or from Padua (on Wednesdays, Fridays and Sundays); they stop at the most beautiful and famous villas linked to illustrious names like Palladio and Tiepolo, for a guided tour inside the villas. 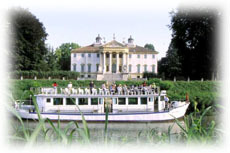 This modern and panoramic boats are heirs to the past; they slowly cruise the Brenta Canal, while a tourist guide on board tells about history, culture and art of the Villas of the Brenta Riviera. Then follow the historical route of the eighteenth-century Venetian burchielli from Padua, crossing five locks allowing the descending of an almost 10-metre high water slope and nine swing bridges, to reach Saint Mark Square in Venice. 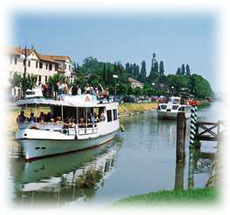 The departure is at the Lock of Porte Contarine or at the fluvial harbour Portello. 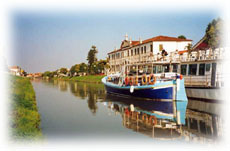 Then, along the Piovego Canal by the sixteenth-century walls and bastions, the boat passes under the old Graissi Bridge and reaches the famous Villa Giovanelli. Past the lock of Noventa Padovana here is a lowering of the water level and navigation goes on along the Tronco Maestro of the Brenta River. Past the lock of Strà, it reaches Villa Pisani di Strà, embellished by Tiepolo’s and Guarana’s frescoes, to visit the spectacular stables and the maze. 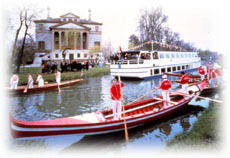 To visit Villa Pisani is like to see the 18th century Venetian life in a mirrow.The cruise goes on along the Brenta Canal, passing in front of Villa Soranzo at Fiesso, with its main façade completely frescoed. Then, there are Villa Angeli at Dolo planned by Scamozzi, a visit to the sixteenth-century Old Mills the crossing of the lock of Dolo with a view of the change of the water level. After that, the navigation continues through picturesque villages and no less than nine swing bridges, to admire the marvellous façades of more than 70 Venetian Villas. Again, another lock in Mira allows the boat to descend 2-metres and to continue its way among villas, like Villa Widman and Villa Barchessa Valmarana. Then, going through the ancient village of Oriago, you will see the sixteenth-century Villa Gradenigo . At Malcontenta, the traveller can admire the elegant Villa Foscari, nicknamed La Malcontenta, a masterpiece by Palladio and a typical example of the Villa-Temple, dominated by its monumental pronaos reflecting in the canal. Further on there is the lock of Moranzani, the last water slope; shortly afterwards the tour reaches the magical scenery of St Mark's basin. The fantastic cruise ends in Venice.